Almost everyone knows that DNA identification has been used to free the falsely convicted from prison through efforts such as the Innocence Project, and that sophisticated techniques of forensic anthropology have been used to reconstruct the identities of unnamed victims of atrocities in places such as Rwanda, Croatia, and Bosnia. Less known is the powerful and admirable role that DNA identification has played in redressing one of the most horrific aspects of the Dirty War (1976-1983) in Argentina. If genetics was distorted and misused in the 1930s and 1940s in order to provide a twisted logic for the final solution in Nazi Germany, 50 years later it provided one of the most valuable tools for healing crimes against humanity perpetuated by Argentina's brutal dictatorship. March 24th marked 37 years since a military junta seized control in Argentina and proclaimed the initiation of the ever-so-Orwellian "National Process of Reorganization." Over the next seven years a vicious junta whose strong arms stretched from north to south, killed an estimated 30,000 people. Many were executed en masse and piled up in unidentified graves or drugged and thrown from planes into the River Plate or the Atlantic Ocean. Abducted by the military, these victims became known as the disappeared, or desaparecidos. Many disappeared were Argentines in their early twenties, college students, and community, political, and labor activists. Most were taken to one of approximately 340 concentration camps and subjected to unimaginable sadomasochistic acts of torture; very few survived. Within weeks of the first wave of disappearances, parents began to search for their children. By 1977, the Mothers of Plaza de Mayo, donning their signature white scarves and carrying photos of their sons and daughters, were conducting somber and valiant weekly marches around the plaza next to the presidential palace. Some of these mothers were also grandmothers whose daughters or daughters-in-law had disappeared pregnant or with young children in tow. Like the mothers, the grandmothers devoted themselves to finding their children and grandchildren. 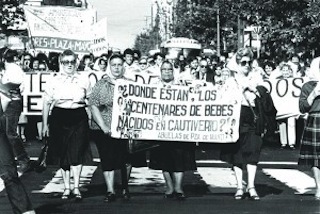 Soon known as the Grandmothers of Plaza de Mayo, this group of women left no stone unturned as they sought out information about their disappeared kin. In her moving book, Searching for Life: The Grandmothers of Plaza de Mayo and the Disappeared Children of Argentina (1999), the late Rita Arditti poignantly describes their quest (and some of the interviews she conducted with the grandmothers are now available online). When the dictatorship ended in 1983, the Grandmothers had determined that approximately 500 grandchildren were unaccounted for; circumstantial evidence strongly suggested that they were alive and living with other families, in most cases being raised with no knowledge of their biological origins. The Grandmothers argued that the military had robbed their grandchildren as part of a systematic plan to remove infants from the "subversive" and "degenerate" influences of their biological families and instead raise them in "good, Christian" homes. Last summer, after a protracted trial a national court upheld this interpretation and military leaders, including Jorge Rafael Videla (already imprisoned) received long sentences. Decades before this verdict, genetics became a catalyst for human rights in Argentina. Soon after democracy's return in 1983, the Grandmothers approached leading geneticists, including exiled Argentine scientists, about the possibility of developing a novel technique that could determine the degree of genetic kinship between intergenerational or extended kin. Dr. Mary Claire King, then based at the University of California at Berkeley, traveled to Argentina and soon developed what became known as the "grandparentage index" using human leukocyte antigen (HLA) compatibility testing. Within a few years scientists supplanted these largely inferential family linkage techniques with more sophisticated and precise mitochondrial DNA analysis; over time incorporating reliable techniques of autosomal marker analysis. By the early 1990s, DNA identification could ascertain with 99.99 percent accuracy the genetic relationship between grandmother and grandchildren, or uncle and nephew. In 1987, Argentina created the National Genetic Data Bank, which has collected DNA samples from hundreds of family members related to a known or suspected missing grandchild. Argentines born between 1976 and 1983 are well aware that their birthdays coincide with the era when hundreds of babies born in clandestine maternity centers were appropriated by the military. To date, 107 grandchildren have been identified with certainty using genetic analysis. In some cases, these grandchildren were adopted in good faith by parents with no awareness of their children's past. As they became cognizant of the situation, these parents helped their children track down their biological origins and have forged supportive hybrid adoptive-biological families. More often, however, children were appropriated as newborns as part of the military's systematic plan and cover-up. It was not uncommon for these children to grow up feeling some sense of estrangement from their appropriators, including from military fathers who did not hesitate to rail against "leftists" and "subversives" at the dinner table, essentially condemning the child's biological parents. In some chilling instances, appropriators had killed the child's parents. Such was the harrowing case of Victoria Montenegro who realized in her 30s that the man she had called father had executed her parents all the while excoriating them as the national enemy. She took her appropriators to court, verified her biological identity with DNA analysis, and relinquished the name she had used for decades. Montenegro described her experience, "I grew up thinking that in Argentina there had been a war, and that our soldiers had gone to war to guarantee the democracy," she said, "And that there were no disappeared people, that it was all a lie." Dr. Victor Penchaszadeh is an internationally renowned geneticist who played an instrumental role in developing the genetic techniques employed by the Grandmothers. In the early 1980s he was at Columbia University, having fled Argentina as the situation darkened before the junta seized power. The Grandmothers asked him about the scientific feasibility of ascertaining genetic connectedness without the physical presence of a direct relative (i.e., a biological mother or father). In tandem with Mary Claire King, he elaborated novel techniques of HLA testing, and over time, helped to refine the highly accurate autosomal marker tests that are the scientific standard today. Penchaszadeh has eloquently recounted this intersecting history of science and human rights in Argentina, noting that the methods developed in his country have been employed in many other post-conflict societies affected by extensive political violence. In addition to the genetic analysis pioneered by the Grandmothers, the Argentine Forensic Anthropology Team established methods of forensic science that to date have identified 9,000 of Argentina's disappeared, and that are being utilized in human rights investigations around the world. 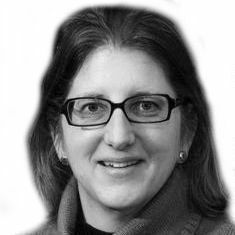 "The tragic experience of Argentina during the state terrorism of 1976-1983 gave genetics the opportunity to vindicate itself as a science that can (and should) be applied in defense of human rights, in contrast with the role it played so often in the past as a tool for social discrimination and racism. Forensic genetics results were key to convicting dozens of repressors involved in forced disappearances and the appropriation of children of dissidents." 37 years after military tanks rolled through the streets of Buenos Aires, La Plata, Córdoba, and Bahía Blanca, and the terror began, Argentina is still coming to terms with its past. Although few in numbers, the Grandmothers have galvanized some of the deepest national soul-searching, prompting Argentines to consider the meanings of both biological and social identity as well as questions of personal and collective responsibility for human rights abuses. Even as the Grandmothers continue to search, many other dimensions of the Dirty War continue to reverberate in Argentine society, as witnessed by concerns about the possible complicity of recently named Pope Francis with the military regime.